As I have mentioned before, I recently acquired new glasses. This was a significant change for me because the last time I got new glasses was before I finished undergrad way back in 2001. At that point in time my motivation for getting new glasses was that I was no longer able to read the blackboard in lectures which is a pretty good reason to get new glasses. This time my vision had no declined quite so bad, although it had declined more than I thought it had. This time the motivation for replacing my glasses was their near self destruction. The nose rest bits were slowly wearing away, the hook at the end of the left leg was coming apart and if I took the glasses off quickly would slide off and stay behind my ear, and the screw holding the rim around the right lens would come loose every now and then. They were dieing, but after 7 years of faithful service I couldn't really fault them for not doing enough. Especially when I'd had that pair for half of the total time I'd been wearing glasses and a quarter of my life. Of course, getting new glasses was not without difficulty. When the right rim first came apart, I had a look in the glasses shop below where I work but couldn't find anything I liked. 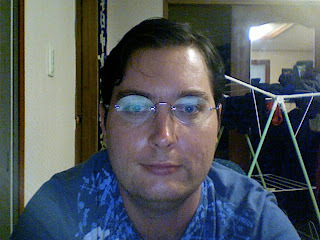 In Asia, narrow rectangular glasses are common, and while they look good on some people, I don't like them on me. So that narrowed down the selection. There's also the fact that my glasses are now somewhat a part of the way I think I look. If I don't have my glasses on the only way I can see my face is if I'm a few inches away from the mirror. And after seven years, my old glasses had become one of the few permanent features of my life. In the time I've had them I've lived in five houses in three countries, graduated university, done honours, started and quit a PhD, five different jobs, and other stuff I can't quite recall but I'm sure has happened. There is definitely a reasonable number of people who have never seen me with a different pair of glasses (everyone who knew me in Japan is the easiest such group to define). The actual shopping for the new pair was made easier by the assistance of my Mum and my sister. They provided an external viewpoint that could tell me how the glasses looked from a distance of more than 4 inches from the mirror. They also prompted and prodded me into making a decision. Even with that, it did take visiting about four glasses shops before I found a pair that I was happy with. It has now been about three and a half weeks since I got the new glasses, and I'm still in the process of getting used to them. My nose has indentations where the nose rests of the old pair would lie on my nose, and the new pair rest differently on my nose. They sit more forward, and not exactly evenly. I also did not get this set tinted, mainly because I didn't want to bother getting the salesman to understand what I wanted, although his English was reasonably good. A consequence of this though is that the world is now awfully bright during the day, and I'm considering getting a set of sunglasses to make up for this. I think next week when I go on vacation I'll use my old set as sunglasses. One surprising thing about the new glasses was the lack of notice they got at work. A few weeks before getting the new glasses I got a new haircut, which got a lot of comments, but it was a few days before anyone noticed, and only one or two comments. I guess this means that I succeeded in getting a pair that were similar to my old pair in appearance. I had at one point in the shopping process considered the idea of getting a new pair custom made based on the old pair, although that would have been ridiculously expensive, and I doubt if it could be done on my sort of financial status. Well, I've run out of things to say about my new glasses, and have been quite distracted for the last ten or so minutes, so I'll post this and be done.